You wouldn’t think a five-year-old music score to a barely remembered PS3 shooter is essential listening in 2017. 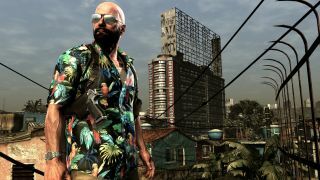 Yet here I am, blasting the Max Payne 3 soundtrack down my eager earholes almost every day in the office, reminiscing about slow-mo dives and a bald pessimist. It’s the perfect example of how an original soundtrack can help a game outlive its usual sell-by date. The usual conversation about songs in games tends to focus on licensed tracks. Billie Jean in Vice City and Goldfinger’s Superman in Tony Hawk’s Pro Skater are two classic examples of songs that go on to define memories of the games they’re in. But MJ’s classic plays on your nostalgia for the song already, and the ska-punk of Superman captures a tone rather than creates one. They complement their respective games, but listening to these songs away from the console is just as likely to trigger memories that don’t involve running over ’80s gangsters or popping kick-flips. A custom score, on the other hand, has the element of surprise on its side, as you create memories to go along with the music you listen to. Take the Hudson Mohawke soundtrack for Watch Dogs 2. Every time I hear one of the songs on the OST, I’m mentally replaying some of my favourite moments from my time in Ubi’s day-glo San Fran. Every frantic beat reminds me of the best parts of Watch Dogs 2. As a whole, the surprising sequel might not be a classic, but the music goes a long way to helping it establish its own identity. But what’s the next step on from an original composition? How about something that is personal to your playthrough? Take No Man’s Sky. Like the worlds you’ll discover, the soundtrack by 65daysofstatic is procedurally generated, so as you arc through the atmosphere, the chances are you’re hearing elements of music arranged in an original way. Imagine marrying the rush of discovering your new favourite song in a game with the thrill of having a role in creating it. Here’s hoping that by the time Max Payne 4 rolls around, I’ll be just as responsible for the sick beats as I am the violence.